Our staff is professional, experienced, and dedicated to helping you plan a professional event with a personal touch. 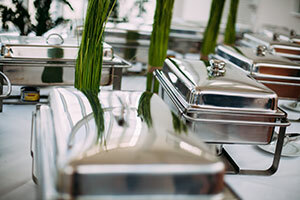 Specializing in buffet service and custom menu design for weddings, corporate events, cocktail receptions, luncheons and dinner parties, we offer a variety of menu choices and the expertise to make any event a success. Call 815-722-1420 today to discuss the perfect catering menu design for your special event. Click the categories to view our large array of dining options and pricing.